For the first time since New Year’s Day 1959, the head of state of the Caribbean island nation of Cuba is someone outside the Castro family. The appointment of Miguel Díaz-Canel to the presidency has fuelled speculation about the future of the country and its economy. The past 10 years have already shown a degree of willingness within the Cuban establishment to implement some much-needed economic reforms, and new leadership provokes questions about a possible acceleration of the reform process. Much will depend on which Castro brother Díaz-Canel wishes to emulate most. Fidel was staunchly communist, scornful of anything resembling capitalism and rabidly anti-American. Raúl, on the other hand, while also sharing his brother’s sentiments, has not been as strident in their practical implementation and has been more open to market-oriented reforms. Over the past decade, Raúl Castro’s government has made modest, but significant, reforms to the economy. The measures – enacted in 2011 and formally known as the Guidelines of the Economic and Social Policy of the Party and the Revolution – state that the socialist planning system will remain the principal management tool of the economy, but that its methodology needs adjustment. Despite the attempts to reconcile them with a socialist system, the measures created a crack in the system, through which hundreds of thousands of people saw the light. In a bold move, the government began reorganising state-owned companies and moving them out of direct state control, opting to tax and regulate them instead of managing them directly. This gave more autonomy to the state-owned businesses that make up around 70 percent of the country’s economic activity. Additionally, private residential real estate markets were opened up when the ban on the private sale of houses and cars, which had been in place since shortly after the revolution, was pulled back. People were suddenly allowed to sell their houses, as well as rent space on their premises. Further, in order to alleviate state payrolls, a number of regulations on small businesses were relaxed. People were once again allowed to hire staff from outside their family – something that was banned in 1968. As a result, the number of cuentapropistas – people registered as self-employed – exploded after the reform package took effect. In 2010, there were 147,000 people registered as self-employed, whereas in 2011 that number shot up to 392,000, signalling a huge entrepreneurial appetite within Cuba. There are currently around 580,000 licensed cuentapropistas, as well as 439 private cooperatives, in the country. Despite the advances made, some of the measures in the reform package – notably the granting of new business licences – have been stalled or suspended. This is due to what the government has said was excessive accumulation of wealth, as well as tax evasion and other factors. This does not necessarily mean, however, that the country is rolling back the progress it has made, but rather that it may need more time to establish the environment these small businesses will be operating in. “If you start a new private sector from scratch, you’ve got to develop all the rules about taxation and regulation. In any capitalist economy, the whole thing is constrained and taxed and regulated by a whole apparatus, so they’re trying to build that,” Emily Morris, an honorary research associate at the Institute of the Americas at University College London, told World Finance. 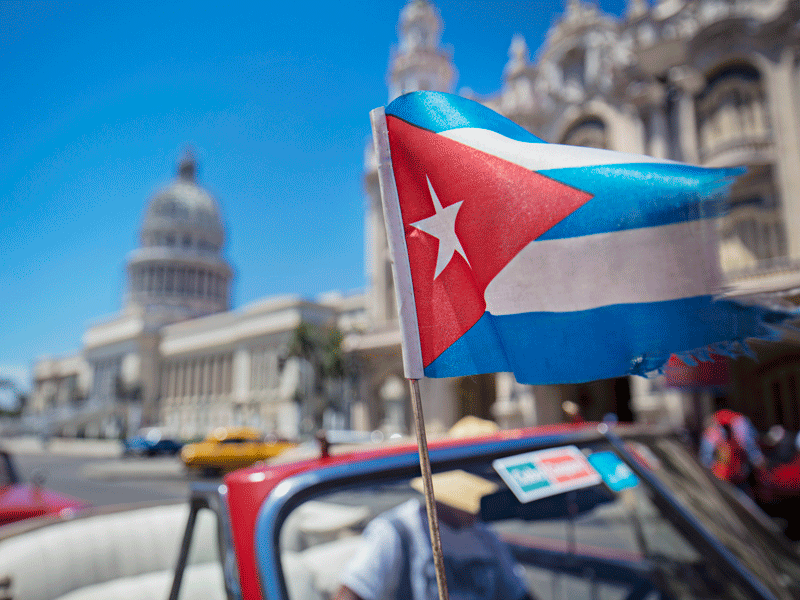 Given the lack of transparency in the Cuban Government regarding state finances, it is difficult to gauge economic activity, but some estimates suggest that as much as 18 percent of GDP comes from the private sector. The nascent private sector has grown not only in terms of size, but also qualitatively. This is evident across the many taxis, restaurants, barbershops and other small businesses across the narrow band of government-approved enterprise activities that are no longer just informal establishments, but increasingly sophisticated professional services servicing Cuba’s growing population (see Fig 1). The question, given new leadership, becomes one of continuity. Despite an ostensible changing of the guard, Díaz-Canel seems to have taken every opportunity to signal that he does not intend to deviate in any substantial way from the path the Castros have set the country on. In fact, it seems one of the principal reasons Díaz-Canel was tapped in the first place was his loyalty to the revolutionary project and the socialist hierarchy. It is entirely possible that Díaz-Canel will zealously defend the status quo against a public that may increasingly see this transition period as an opportunity for change. The recent history of handpicked successors in Latin America – notably in Venezuela – also suggests that a protégé can even bring about more economic harm than their predecessor. It is not unprecedented, however, that a loyal party apparatchik that rose through the ranks of a deeply entrenched ruling system would take bold steps to change their country’s course. Mikhail Gorbachev is perhaps the most obvious example of this. That said, even if Díaz-Canel had lofty reform ambitions, it would be difficult for him to single-handedly change the country’s course. The role of the president in Cuba is not the same as is traditionally understood in most other countries: unlike in a democratic system, where the president is elected and has authority stemming from popular mandate, in Cuba the president is actually the President of the Council of State, and is just another member – albeit an important one – of a bureaucratic system wherein major decisions must be approved at multiple levels. Additionally, though he is no longer president, Raúl Castro remains First Secretary of the Cuban Communist Party, the most powerful political organ in the government. “There are indications that [Díaz-Canel] may be more liberal socially, but in terms of his economic policies, in terms of national security, I think it will very much be continuing this very carefully planned [reform] process that keeps disappointing international business media because they want to see some dramatic Eastern-European-style transition, and I don’t think that’s on the cards,” Helen Yaffe, a lecturer in economic and social history at the University of Glasgow, told World Finance. One of the most important hurdles facing Díaz-Canel’s economy is the integration of its dual-currency system. At present, the island has two operating currencies: the Cuban peso (CUP) and the Cuban convertible peso (CUC). The CUP is the main legal tender used domestically, whereas the CUC is primarily used for state functions and foreign dealings. The dual system was introduced in the aftermath of the collapse of the Soviet Union, as Cuba was dealing with the catastrophic economic fallout (see Fig 2) of losing its principal supporter. In order for market forces to be introduced effectively, there needs to be a reliable form of market pricing, which is extremely difficult to establish when there are multiple exchange rates operating in the same space. According to Morris: “[Diáz-Canel] has got an incredibly distorted economy because of the price exchange rate system, I think that’s the number-one urgent thing that needs to be tackled – I think it’s more important than further liberalisation at this moment.” She added that in the absence of a solution to the messy exchange rate system, liberalisation would lead to people making money from intermediating between the two markets, which doesn’t increase production for the economy. Additionally, it is probable that Cuba would get sucked into an inflationary situation if the transition were not handled correctly. If the value of the unified currency was set somewhere between the existing ones, then demand for goods would rise as the CUP gained purchasing power. Supply, however, would not see the same kind of rise, leading to a potentially sharp hike in prices. Unifying the currency is a crucial stepping stone if any kind of private sector is going to be established on the island. Having such a distorted economy makes it impossible for companies to be valued accurately. This acts as a disincentive for foreign investors to put their money in Cuba, as they have no reliable way of determining the value of their investments. Perhaps the biggest external factor casting a shadow on Cuba’s economic development is the half-century-long economic embargo that the US has had in place on the island. Apart from preventing trade with the biggest market in the Western Hemisphere, US sanctions also cut Cuba off from international funding from entities like the World Bank and the Inter-American Development Bank, severely curtailing its ability to develop its economy and infrastructure. Remarkably, Cuba has managed to stay afloat despite sanctions that would cripple most other small economies. “I actually interviewed the [former] president of Ecuador, [Rafael] Correa, and he said to me: ‘Ecuador wouldn’t last 50 days with a blockade like that, and Cuba’s lasted 50 years’,” said Yaffe. However, the embargo nonetheless acts as a major disincentive for foreign direct investment, as companies tend to be risk-averse and do not want to end up on the wrong side of the US Treasury, despite international law deeming the embargo to be unlawful. In 2013, world leaders congregated in South Africa to bid farewell to Nelson Mandela. At his funeral, President Barack Obama made a historic gesture when he extended his hand to shake Raúl Castro’s – an act theretofore unimaginable against the backdrop of post-revolutionary US-Cuba relations. The handshake marked the beginning of a rapprochement process that would culminate in the opening of a US embassy in Havana. All of a sudden, a whole host of possibilities opened. 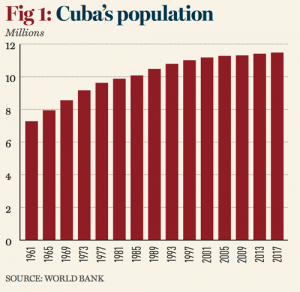 Observers wondered if this meant there was a chance for the decades-old economic embargo to be lifted and, if so, whether that would result in the liberalisation of Cuba’s economy. The prospect of thawing over that most stubborn remnant of the Cold War has become increasingly small, however, given the attitudes of the new US administration. Travel restrictions to the island, which had been relaxed under Obama, have been tightened once more by Trump. This led to a sharp drop in the number of American visitors going to Cuba in the first few months of 2018 compared to the previous year. Cuba’s troubles with its neighbours extend beyond just the US; the island nation is increasingly finding itself without sympathetic allies in the region. The ‘pink tide’ of left-leaning countries in Latin America, which began forming in the 2000s and peaked in the early 2010s, has mostly subsided. The Bolivarian Alliance of the Americas (ALBA), started by Cuba and Venezuela under then-president Hugo Chávez, is a shell of its former self and doesn’t have the regional support it once enjoyed. Having the support of ALBA meant Cuba was able to monetise its core competencies, primarily through exporting medical professionals, without having to compete in regional free markets. The impeachment of President Dilma Rousseff in Brazil, as well as the subsequent imprisonment of former president Luiz Inácio Lula da Silva, has not boded well for Cuban-Brazilian relations. Further, the election of Lenín Moreno in Ecuador removed another ally, Rafael Correa, from office. The trend is only compounded by the ongoing political turmoil in Nicaragua that is threatening the presidency of Daniel Ortega. Perhaps the most worrying regional development for Cuba in the past few years, however, has been the implosion of the Venezuelan economy under Nicolás Maduro. Venezuela has, for most of the 21st century, been Cuba’s biggest supporter in the region. The Cuban economy has been kept afloat, particularly during times of high oil prices, by cheap oil imports from Venezuela. Oil imports have since decreased, although the impact has been blunted by the currently low global oil prices. However, when prices begin to rise again, Venezuela’s reduced capacity is going to be strongly reflected in Cuba’s economy due to its dependence on imported oil. Cuba’s economic model and its political system are so deeply interlinked that it is difficult to see how any major introduction of market forces can be reconciled with a political apparatus that, for 60 years, has been predicated on preventing exactly that. 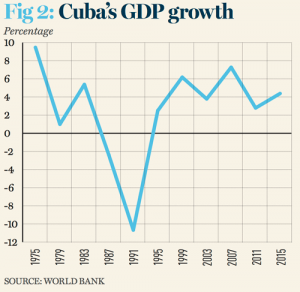 The bigger the private sector, the less centralised the economy, and this poses a potentially existential threat to Cuba’s Marxist revolutionary project, making the prospect of liberalisation scant. This creates a catch-22: a significant economic shift would need a change in the political structure, but a significant change in the political structure will be difficult to come by without a change in the way the economy is run. The modest changes that have already been enacted have created momentum, however, and as entrepreneurial sentiments rise, so will the demand for a more market-oriented environment. “The economic change is having political implications, clearly. Once you have a large portion of the population no longer dependent on state employment, you have a political change already,” said Morris. Change may not come quickly, but there is reason to be hopeful. Momentum has undoubtedly been building, with an increasing number of people now registered as self-employed. Further, the number of people using the internet more than doubled between 2010 and 2016, softening what has been a historical stranglehold on the Cuban citizenry’s access to information. It is not yet clear what the post-Castro era will have in store for Cuba, but the prospects of a dramatic change in the economy are – at least in the short term – less than stellar. Short of major political upheaval, economic progress in Cuba is likely to be frustratingly slow, but there is good reason to believe it will be increasingly influenced by the Cubans who want change.